Have you ever been screwed by somebody before? Of course, you have, we all have. At one point or another, we found ourselves in a precarious situation that was hard to get out of. In many circumstances, we can often react in one of two different ways. We might react angrily or we might feel victimized. A while back I found myself in a tough position where a business partner was bringing out the worst in me. Was he a bad guy? No, not necessarily. But somehow I had given him more control over my attitude, and my business, than was appropriate. Anybody who’s started a business can tell you, it ain’t easy. From figuring out the business plan, getting funding and executing - it’s tiring work that is hard to do solo, let alone with other people at the helm. Sites like founderdating.com exist to help entrepreneurs find co-founders and early employees to help them execute part of the plan that is essential to creating a successful business. Unfortunately, many of those partnerships often end up in disaster and are often related to the amount of equity and actual time or overall investment one or more of the co-founders are putting into the business. In fact, according to Harvard Business School professor, Noam Wasserman who published the book “The Founder’s Dilemma", discovered that 65% of startups failed as a result of co-founder conflict. This is higher than the divorce rate in America today. In other cases, a founder or employee can become so heavily invested in the business they might start treating others as outsiders and do whatever is necessary to protect their livelihood. In the late 2000’s I found myself in this exact position. My business was growing quickly and had become a burden to my very health and well-being. I was spending every waking hour being on-call for emergencies and handling client tickets and even chats whenever they called for my attention. In short, I was having to build and manage the business at the same time and I decided to bring in somebody to help manage the day-to-day operations. Everything was great at first, but in time his actions slowly started to appear different than what he said. On the surface, it seemed like everything was fine and he was handling issues that I no longer had to concern myself with, but in doing so my connection with the business started to fade. I was no longer dealing with customers directly, or having the opportunity to see issues face to face. Instead, I was relying on my new-found partner to keep me informed on the issues in the business. After almost a year though, our relationship started to fall apart as I started to sense an underlying feeling of manipulation and deceit. He wasn’t listening to my recommendations or telling me about the real problems going on in the company. This led me to a feeling of helplessness as he had essentially inserted himself into becoming a core part of how the business was being run, something that I had become unaccustomed to. I felt frozen, having mixed feelings about him who I felt had devious intentions, yet afraid of firing him for the fear that he might damage or potentially destroy the very thing I had worked so hard to create. Between my duties for the company and experimenting with other business ideas, it eventually got to a point where I wasn’t spending much time interacting with our team. I had trusted my partner to take care of those daily operational elements and spent my time on big-picture strategy. Now, I’ll be the first to mention that I can, at times, be difficult to work with. Sometimes I can become so much of an idealist/visionary that I forget to take the necessary time to make it clear that I appreciate those working with and for me. Over time my partner convinced me that I shouldn’t interact with the team at all. He sold me on the idea that, anytime I interacted with our team, they felt uncomfortable. Once I became aware of the issue, I started work on remedying it to ensure I provided my employees with the supportive attitude and responses they need and deserve. Not wanting to negatively impact the team while I worked on improving myself, I gave in and went through him for everything – rather than going straight to the appropriate team member. Little did I realize that I was making a big mistake. My partner did whatever it would take to prevent me from interacting with the team – even in the slightest. It eventually got to the point where I was accepting incredibly negative and derogatory comments from my partner – and believing them! This was further fueled by a negative perception about me that he was sharing with the company to enhance his control. We often shape the reality that we live in – and this is particularly true in business. Every great company begins with people who have a vision that others think is ridiculous. Unless you and your team are able to have a positive attitude when everyone else says it won’t work, it definitely won’t work. As I internalized these responses and accusations from my partner, it impacted my productivity. But even more importantly, it took a toll on my attitude. I found myself constantly discouraged and depressed – questioning my ability to accomplish anything. I started to think I could never be productive, that my previous successes were just luck. The real me was an unproductive and unsuccessful jerk who was incapable of interacting with others. Looking back at it now, I can trace these thoughts to the many conversations and emails between myself and that business partner. I didn’t fully understand what was going on until I started seeking outside help. My lawyer tried to help mediate the situation but it seemed to only fuel the fire. It was then, my entrepreneur friend, Brian Smith, creator of the Founder’s Organization recognized my situation to be that of the Drama Triangle. I read the book, How to Break Free of the Drama Triangle & Victim Consciousness by Janae and Barry Weinhold and was able to see my situation from a whole new angle. It turns out that I had made myself the victim in a drama triangle. But what is a drama triangle? Well, I think the best way to describe it is by first sharing a story from Weinhold’s book. Once, a huge, scaly dragon terrorized a small, peaceful kingdom. It ate the farmers’ flocks and trampled their crops, the people were too afraid to go to the woods so they couldn’t light their fires. By the end of a month, they were hungry and cold. “What will it take to make you go away?” they asked the Dragon. “It’s a deal,” said the people, before going to the King to tell him what had been decided. Only one problem remained, which damsel should be sacrificed? In the end, it was decided to draw lots. When the King’s youngest daughter, the loveliest Princess, drew the shortest straw, his heart broke. But a deal is a deal, so the Princess was tied to a giant kebab stick and left for the Dragon. As she waited helplessly, watching the ugly monster crawling towards her, licking its lips, she nearly fainted. Then she saw a knight, in shining armor racing towards her with his lance lowered at the Dragon’s heart. The beast was so busy stirring marinade in a giant bowl, it didn’t realize what was happening until the Knight’s lance had speared his heart. As the Dragon lay dying on the ground the Knight untied the Princess. “My name is George, Saint George. Will you marry me?” “Oh yes!” said the Princess happily. In this Triangle, the Rescuer (Saint George) saves the Princess and the Kingdom (both victims) from the Persecuting Dragon. Let’s consider the story from a different perspective, and see how the same characters can be in different roles at the same time. “It was terrible what they did, they promised him a damsel if Terry left the Kingdom for good, it was an oath, they gave their word. He’d hardly had a bite to eat all week because he’d been giving everything to his kiddies, and his one treat was going to be damsel in sweet pepper sauce – my special recipe” Mama Dragon blew her nose into a tissue which erupted into flames and settled in a pile of ash at her feet. The second story has the same characters, but now St George is the persecutor and the Dragon (and his family) are victims until Papa Dragon starts to make moves towards persecutor. What is a drama triangle? As you look at the story above, there are two key elements to drama triangles that can be extracted. First, drama triangles are based on perspective. In other words, the individual seen as the “rescuer” to one party may actually be the “persecutor” to another party. This means that the first step to avoiding drama triangles is to step back and evaluate the big picture. Who is being victimized, who is really holding them down, and how can the victim be empowered to make their own decisions? By taking a step back, you ensure that you are resolving the triangle rather than creating another. Second, most of us are involved in several drama triangles at a time. The three players in a drama triangle are the victim, rescuer, and persecutor – and we often play several roles across our relationships. For example, at work you may be a “rescuer”, trying to help your coworkers/partners avoid a persecutor (such as a rude client, challenging task, or governmental regulation). Then, at home, you may be a victim to your wayward child – giving her anything she wants despite knowing that it will hurt her, you, and the rest of the family. As the picture below shows, drama triangles consist of three players that ultimately work together to prevent a victim from succeeding. 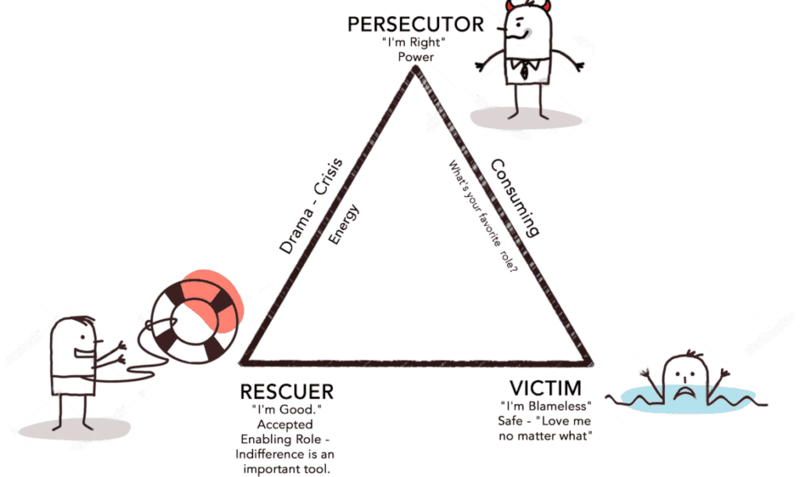 In addition to the victim himself, the persecutor deliberately tries to hold the victim down, while the rescuer prevents the victim’s growth through trying to protect the victim without allowing the victim to develop the skills he needs to overcome the task himself.How can drama triangles play out as entrepreneurs? One of the most obvious is when one partner has complete control over one element of the business. In many amateur business partnerships, one partner seems to focus on the business, while the other one spends their time working in the business. This can easily lead to a series of drama triangles with either party being the victim – creating resentment between the founders. And this is exactly what happened to me. Being more creative and process-oriented myself, I often bring on partners who are willing to put in the sweat equity to ensure the company runs day-to-day. This, unfortunately, can create a drama triangle like the one with the villagers, Saint George, and the dragons. My business partner and I each had a different perspective of who we were in this unhealthy drama triangle. For me, I saw my attitude and difficulty getting along with people as a prosecutor. My business partner was the rescuer – essentially protecting me from myself, and from ruining the business. Of course, the reality was that both my attitude and my partner were holding me down. My business partner, meanwhile, saw a different triangle. He felt that he deserved a higher percentage of the company’s profits because he was putting in far more time than I was. Although I was the one financially backing the company, had developed the initial concept, and was creating the processes necessary to keep the business operating, he was certainly putting in more time. Therefore, for him, he was the victim. I was the prosecutor holding him back from his own personal success. And, as it turned out, keeping me out of the day-to-day operations of the company was his rescuer. I thought that my partner was keeping me out of the daily operations to protect the company – but it turns out it was to protect himself. After reading Weinhold’s book, I knew that we needed to make some changes – for both our sakes. To do this, I took two actions. First, I confronted my partner and told him that I would no longer tolerate his repressive and verbally abusive comments toward me. Second, I began making direct contact with the team – and I was shocked at what I learned. I had turned a blind eye to certain parts of the business. And, although I told myself it was because my business partner was handling these elements, the reality of it was that I was afraid of what I would discover – and it wasn’t pretty. In short, I was getting screwed and it was only a matter of time before the business would’ve failed. Here my partner had convinced me that I was the jerk who needed to minimize my time with the employees when, in reality, it was him! He simply didn’t want me to know all of what was going on. Transactional analysis is a theory in psychology that suggests we all should act like adults but often end up in some sort of parent-child relationship. This had happened in my business relationship. As my partner took on more of a parent role – telling me I was inadequate and rude, I took on the child role – agreeing and apologizing profusely. However, once I responded in more of an adult/parent manner, our relationship quickly went downhill. My partner wanted to maintain the control he had over the company – and wasn’t willing to find a reasonable way to work things out. So, with both of us at odds, he finally came to the only reasonable solution that seemed possible – to part ways. I offered him a severance package and maintained full control of the company. He’s now free to work on his thing in a way that he believes is appropriate and I’m able to further grow this company the way that I see best. Clearly define responsibilities, equity, and compensation ahead of time. Provide vested equity – requiring your partner to deliver results in order to receive equity. When offering compensation, have a term in the contract that permits you to buy back those shares if parting ways is necessary. If something doesn’t seem right, investigate. Don’t allow yourself to be treated poorly by your partner (and don’t treat your partner poorly). Ensure that you both are acting like adults. Contracts and policies are annoying – but they’re necessary. The more policies you have in place (even if just between two partners) the fewer issues will arise later on. This includes what and where funds can be spent without the partner’s approval, appropriate behavior with employees and clients, and appropriate use of time (always focused around results). Follow the points above and you’ll be far less likely to end up in an awkward situation with your partner. Since parting ways, I was able to regain control of the company and was able to successfully sell it without much baggage. Drama triangles are a common occurrence for entrepreneurs – with almost any key stakeholder. Understanding what they are, and how to overcome them, has already made my life far easier – as an entrepreneur, partner, employer, and investor. What kinds of drama triangles might you be involved in? At work or at home?